Last week I heard about a Groupon deal gone South. 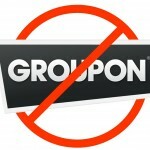 Initially, Groupon gave us the impression they were suspending deals in one particular industry sector while reviewing internal procedures. Cheaper Than Dirt recently did something similar that ended up just being a scheme to increase their prices in the wake of Sandy Hook. Gun owners are not idiots, despite what research funded by the Joyce Foundation tells you. Furthermore, we don’t like being lied to. Well… this one caught Groupon in a lie. I recently sent Groupon an email using their support ticket system at their website. I asked about their decision to suspend gun-related deals. I specifically wanted to know if any progress toward a decision had been made. I thought of my support request more or less as an email or phone call to a legislator. I really just wanted them to hear me. I apologize for the delay in responding! We’re currently experiencing an unusually high volume of requests, but we are working hard to get back to everyone as soon as we can. Thank you for reaching out to us. We appreciate your feedback and take these inquiries seriously. Thank you again for contacting us and please let me know if I can do anything else to help. I wonder just how vocal the opposition was. Did they flock to non-gun-related deals like gun owners did to Austin’s Central Texas Gun Works concealed handgun training deal? Were their non-gun-related deals so popular that Groupon decided to triple the limit, like it did with Texas Gun Works’ deal? Or are they just a bunch of loud mouth complainers who get heard? Well, I heard what I needed to out of this fiasco. Groupon is so scared to upset a minority (self-reported gun ownership is at the highest level since 1993), that they are willing to play shenanigans. I heard them say that they were “looking into it” and will quietly try to make a ban on gun-related deals their new norm. If that’s not what they meant to say, then too bad for them. Perception is reality and that’s what I heard. So long, Groupon.